Prompted by the Australian Government’s review of the AQF, the Victorian Government asked EduGrowth to help them start a conversation about the impact on education providers, EdTech and education innovation in Australia if micro-credentials were to be included in the AQF. Liz Johnson, DVC Education Deakin University, firmly predicts micro credentials will be included in the AQF when the review is completed in September 2019. “It’s important that however the industry moves forward with relation to micro credentials, that we do so in a way that doesn’t stifle innovation”, Liz Johnson. Liz highlights three areas in which micro credentials offer immediate opportunities; as a way of certifying past learnings, recognising the burgeoning of learning for self interest via massive open online courses (MOOC) and for employer driven continued professional development. The Australian Qualifications Framework (AQF) is the national policy for regulated qualifications in Australian education and training. It is highlighted that since the last review, between 2009-2011, there have been significant technological advances in education delivery, increased uptake of sub-qualifications and changes to international practice related to qualifications frameworks. Liz described the current AQF as a hierarchy of qualifications; “yet students don’t work through it in a linear way”, they weave and change directions. Micro credentials could enable bridges between qualifications, be stackable or unbundled; but the greater question is should they count toward a larger qualification? Rohan Chandler, VP Partnerships GO1.com, approached the discussion from a project-to-project perspective; if there is a skills short-fall then having a staff member complete a shorter form credential is more attractive to an employer than undertaking a lengthy Masters. For HR based companies wanting to confirm staff have the appropriate ‘skills required to play’, Rohan believes shorter form credentials are easier for these companies to recognise and qualify. Anthony Morris, CEO Cahoot Learning highlighted in all his dealings with industry, he has rarely been asked about alignment to the AQF. Andy Giddy, Executive Director Business Innovation La Trobe University, discussed the definition of terms in relation to micro credentials; highlighting the need for a common understanding relating to length, assessment, weighting and overall perceived value. Increasingly used terms such as ‘nano degrees’, ‘micro masters’ and ‘micro subjects’ identify how branding is becoming increasingly important for education providers. Anthony added these terms are “marketing driven fictions” designed to validate a providers offering in the mind of the consumer. Ashley Jones, Head Professional Practice and Industry Partnerships DeakinCo, identified how micro credentials can provide choice for students; “it provides the opportunity for a student to create their own learning passport, via multiple providers”. The challenge for the industry is to be able to offer, recognise and enable this model seamlessly. Recognising that not everyone is a lifelong learner, Rohan highlighted those seeking corporate or industry learning outcomes are just seeking the “minimum requirement” to pass a capabilities audit. In this respect, he advocated that micro credentials don’t necessarily have to work toward a university endorsed degree. Ultimately the market will decide; if a qualification is recognised by employers, it will be recognised and valued by students. If they are not recognised by employers or future employers, people simply won’t undertake it, and if they are too expensive, they will find alternative ways to access the content. Ashley sees the opportunity to draw on an industry “community of practice” to identify and validate skills and learnings for micro credentials. In this respect, micro credentials could be seen as a portfolio of evidence; a digital badging system, benchmarked to industry and recognised by industry. The implications of micro credentials as part of the AQF will provide significant opportunities to the industry if executed well; similarly could destroy innovation if executed poorly. When asked how he feels about the prospect, Anthony responded “nervous and hopeful”. Rohan added that we have a real opportunity to take Australian technology and education global with the added credibility from the AQF. Micro-credentials within the AQF: Who’s the winner here? 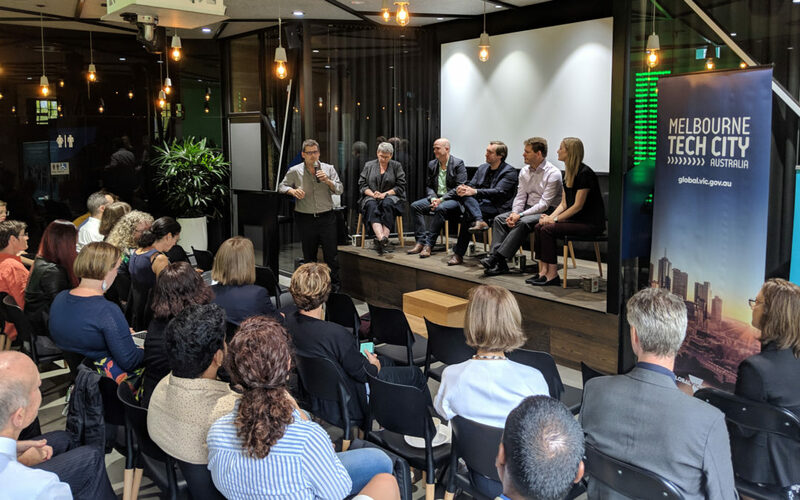 was held at Study Melbourne 17 Hardware Lane Melbourne on Tuesday 19 March 2019.